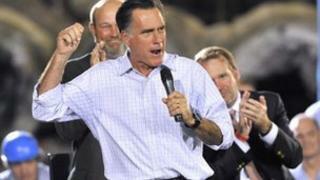 Image caption Latest polls in six key states have left Mitt Romney's supporters concerned. What are the biggest short-term risks hanging over the global recovery? If you asked most people in the financial markets that question they would point to two things: another blow-up in the eurozone crisis, and the lurking fear that US budget policies are heading over a "fiscal cliff". The recent spike in Spanish long-term borrowing costs suggests that global investors are starting to agree with them. Some would point to similar complacency in the US, where the central bank has promised, in effect, to spend an unlimited amount getting unemployment down. Investors reacted to the Federal Reserve's announcement of more "quantitative easing" with near-euphoria. Apparently, many believe the extra money being pumped into the economy will help insulate the recovery against the costs of more budget gridlock in Washington. But that might also turn out to be over-optimistic. A quick reminder of what's at stake in that budget stalemate: on current law, US fiscal policy is due to tighten by over $600bn at the start of 2013 - the equivalent of around 4% of GDP. That would be largely the result of the old Bush income tax cuts expiring and a number of automatic spending cuts kicking in. The Congressional Budget Office thinks that would send the US straight back into recession in the first half of 2013. Every private economist I have spoken to agrees. (For reference, that 4% of GDP budget tightening would be three times more than the UK government is planning for next year). Will Democratic and Republican law-makers come to some arrangement, before January, to ease the blow to the economy? The overwhelming assumption in Washington and the financial markets is that they will. But, no-one can tell you how, or when this is likely to happen. And quite a few people I have spoken to think an agreement might not be reached until after some of those automatic tax rises and spending cuts have kicked in. Put it another way: relations between Congressional leaders and the President are now so terrible, the world's largest economy might actually have to go off a cliff before politicians get serious about hauling it back up again. Hardly a reassuring prospect for the rest of the world. Between now and 1 January, there is that small matter of a general election. The hot topic in Washington is how that will change the argument between the two parties - if at all. Never say never. When it comes to US Presidential elections, and opinion polls, you really never know what's going to happen. But today the electoral contest between President Obama and Mitt Romney is looking much less close than it was a few months ago. The latest New York Times-CBS polls in six key states have left Romney's supporters especially concerned. (Polls Point to Larger Lead for Obama in Ohio and Florida). No Republican has ever won the presidency without Ohio, and this new poll shows Mr Obama leading Mr Romney by 53% to 43% in that state. The President is also 9 percentage points ahead of his challenger in the key swing state of Florida. (The margins for error in these polls are about 3 percentage points either way). Assume, for the sake of argument, that there are no more big upsets and President Obama wins. The Republicans are still very likely to hold a majority in the House of Representatives in the next Congress. But pollsters say their chances of taking the Senate from the Democrats are also now looking weaker than before. So, on the surface, at least, the balance of power in Washington after inauguration day on 20 January could be almost exactly the same as it is now. Will the underlying dynamics around the budget have stayed the same as well? That is the big debate here in Washington. Some say no, because an Obama victory would be considered a mandate for the Democrats' approach - even by Republicans. For example, a senior Republican member of the House Budget Committee told the Washington Post last week: "This is a referendum on taxes. If the president wins re-election, taxes are going up" for high income households. And "there's not a lot we can do about that". But others say the dynamic will go the other way. Republicans will be furious at the way President Obama fought his campaign - particularly his attempts to scare senior citizens about Romney's plans to rein in health spending. And, fresh from their victory, the Democrats will be in no mood to compromise either. We can't say anything for sure until we see what actually happens in November's election. But if Romney does lose, it is looking as though the future of the world's most important budget might just depend on who Congressional Republicans blame most for failing to win the White House: President Obama, or Mitt Romney himself.